If in doubt, sit them out. That is the key message in the Football Association's new guidelines for managing head injuries at all levels of the game. Any footballer suspected of having sustained a concussion, whether during a game or training session, should be immediately removed from the pitch and not allowed to return until the appropriate return-to-play protocols have been followed. Adult players suffering a suspected concussion should not return to play until at least 19 days after the injury, with a 23-day minimum for those aged 19 or under, although in all cases it is recommended that a player is referred to a medical professional for diagnosis and advice. 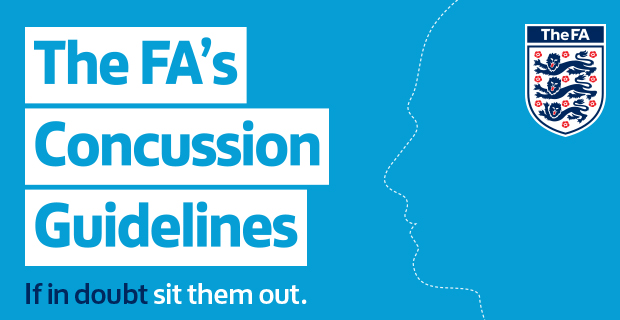 The FA's new guidelines - a downloadable 17-page document (PDF) - outline what concussion is, how to recognise it, what to do next and how and when to return to play. 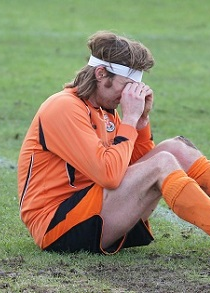 Also available as on online resource, the guidelines are based on evidence and best practice from around the world are designed for those who manage head injuries in professional and grassroots football - from clubs and schools to parents and doctors. Dave Reddin, the FA’s head of performance services, said: “We have been very fortunate and I am very grateful that we have had the combined expertise of an international expert panel in reviewing and revising our guidelines. Last year the FA used England players to raise awareness of head injuries in football, but this is the first time they have published a set of dedicated guidelines in a single document setting out how a concussion should be managed from the time of injury through to a player’s safe return to football. The FA's head of medical services Dr Ian Beasley believes the guidelines will help to ensure better management of head injuries across the game in England, thereby making it safer for more players at every level. The FA setup an expert panel to advise on head injury in April, following a long-running campaign by the family of former West Bromwich Albion striker Jeff Astle, who died in 2002, aged 59, from chronic traumatic encephalopathy (CTE) - a degenerative brain condition normally linked to boxing. Dr Willie Stewart, a consultant neuropathologist at Glasgow’s Queen Elizabeth University Hospital, found that Astle, who was famed for his heading ability, had suffered repeated concussions during his career. Now a member of the FA's expert panel, Dr Stewart welcomed the new guidelines, saying: “They are a fantastic development and a good example of the FA's commitment to providing a safer game for participants at all levels. Hopefully they have the potential to impact on sport in England as a whole." Earlier this month, United States Soccer announced a total ban on heading for all under-11s amid concussion fears, whilst it also restricted the number of headers 11- to 13-year-olds can make in training. Head injuries in sport are under huge scrutiny in America, where in April this year a federal court approved a $765m settlement between the National Football League (NFL) and over 5,000 ex-players with serious medical conditions associated with repeated head trauma. CW Poll: US Soccer has banned heading the ball for all under-11s amid concussion fears. Do you agree? Vote now on your club or league website - or here on our demo site - and have your say on anything to do with this important issue in the comments section below.